Whether or not this was originally conceived as a snuff bottle is questionable. 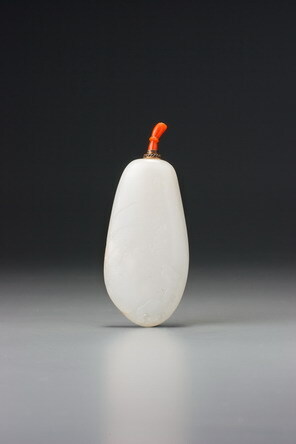 The form is perhaps more likely as a snuff bottle than as a pendant, although the detailing of the neck suggests a conversion, as there is the hint of a depression to one side of the mouth that might have provided the original channel for a cord. The other indication of a conversion is to be found in the hollowing, which, while functional, does not follow the outer profile of the bottle and is out of keeping with the extraordinary quality and devotion to detail of the exterior carving. Setting aside the question of its history, this snuff bottle, as a work of art, is of superlative quality. The material is as white as can be reasonably expected of nephrite, and it is flawless except for a tiny area on one narrow side of the bottle, which has been perfectly incorporated into the design as the stems of the flowering orchid plant.